On the edge of the solar system, 3 billion miles from the warmth of the sun, a dwarf planet has spun through the void unseen and unknown for centuries. Pluto. A ball of ice and rock, that dances in an endless waltz with its neighbour moon Charon. So what the f**k was I doing there? Now before you pull your underwear down to your knees and soak the floor in a pulse-pounding climax, I haven’t technically been the first midget to set foot on a dwarf. The flight leaving from Heathrow to Pluto had apparently been cancelled, due to mass panic from someone from across the seas imposing a minor travel restriction of 90 days to Somalia. Instead I behaved very unlike myself. I put down my favourite copy of Mein Kampf and my tobacco pipe, and embraced the wonders of 21st century technology. I went for a trip to Virtual Reality. The room went dark as the VR prepared to work its magic. The screen booted into life and the magnificent spectacle of open space, and a billion stars, appeared before me. A dramatic orchestral number rang in my ears, the dwarf planet that had hidden for a millennial (as in the length of time, not the sort that hate democracy and are drunk with self-entitlement) rose from under my feet like a sunrise. I gawped like a child in a very large toy store, and it took a moment to realise that I was standing where no being had ever stood before. I looked down at the crumbling rocks and ice by my feet, then straight ahead at the mountainous terrain. A voice echoed out from behind the chorus and it told me of a distant blue dot that was the sun. I feasted my eyes on the craters, the peaks, and savoured the nooks and crannies of the often-overlooked Pluto, with its red and glacial white surface. I watched, floating further and further away from the seemingly massive planet that began to shrink as it succumbed to the perilous size of its distant neighbours. 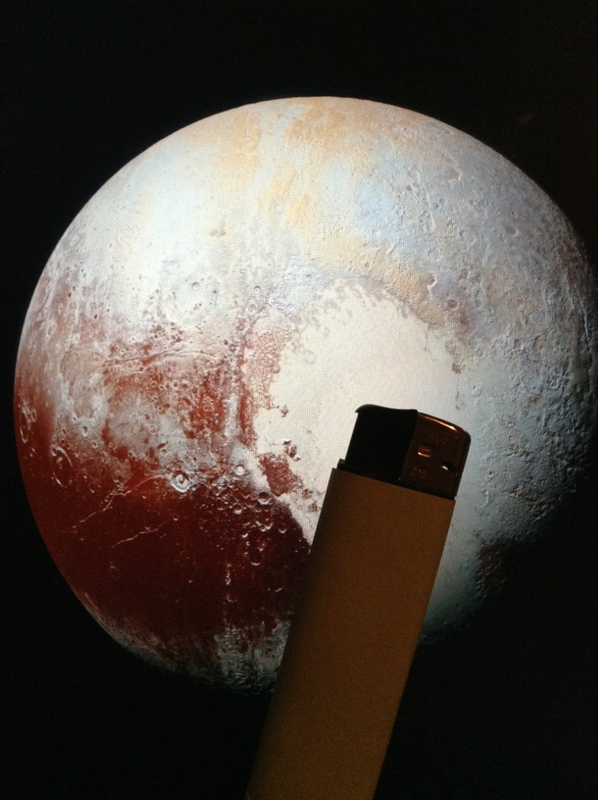 Out this far in space, even my trusty lighter would not be able to keep my mittens warm. I was astonished by the new technology, and excited by the fact it was still only scratching the surface. Despite keeping my feet firmly on the Earth, the VR made me feel very far from home.